Clinging to the top of a cliff on the northern coast of Ibiza, Villa Xiomara seems to not only defy gravity, but also any previously held doubts that you can ever truly escape. You'll find Villa Mireya a few kilometres inland from Ibiza's northern coastline. Surrounded by countryside and hills, this luxury holiday home must be seen to be believed. With verdant clifftop views on one side and a staggering seascape on the other, Villa Eliseo finds itself at the centre of its very own oasis. High up. This villa with private pool is located in Sant Joan de Labritja and sleeps 6 people. It has WiFi, air conditioning and barbeque facilities. 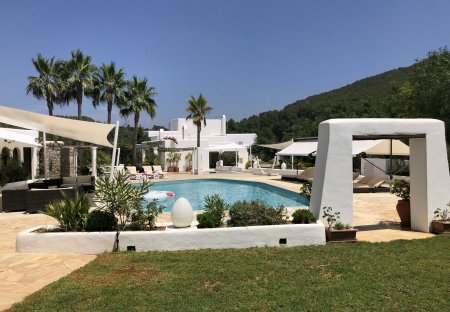 Casa Sardana fuses old Ibizan charm with all of the modern comforts you need for a wonderful holiday.Outside boasts plenty of spaces to dine in, sleep in and unwind in. 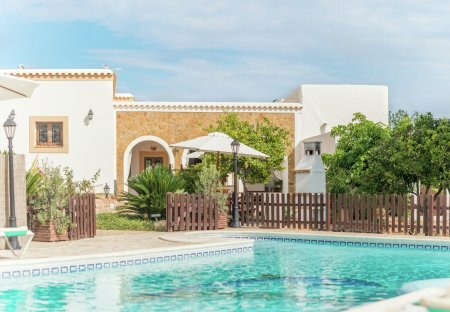 This villa with private pool is located in Sant Joan de Labritja and sleeps 12 people. It has WiFi, air conditioning and barbeque facilities. Villa Brigitte is a traditional Iberian “finca” style property which blends the best of classical architecture, with a fresh and modern finish. This villa with private pool is located in Sant Joan de Labritja and sleeps 6 people. It has WiFi, barbeque facilities and garage. The peaceful and secluded village of San Juan (known as "Sant Joan de Labritja" in Catalan), is the furthest from Ibiza Airport and the most rural region of the island. It is also the most northern town in Ibiza, taking approximately 30 minutes by car from the airport. Discover a natural landscape of isolated coves, pristine bays and some of Ibiza’s most tranquil beaches. Known as the last village in Ibiza, its calm nature makes it a favourite with families and those looking for some peace and quiet. Its untouched beauty allows you to explore a natural coastline of sand and rock, as well as a few hidden caverns, one of which has been converted into an amusement park. Water sports can be enjoyed in the neighbouring Port Sant Miquel, not to mention the surrounding bays and islets. As a family-friendly resort, you’ll find plenty of bars and restaurants scattered along the picturesque coastline. Outdoor enthusiasts and nature lovers should feel right at home here as Ibiza’s beautiful rural countryside is the perfect place for cycling and leisurely strolls. The island's history is rich and fascinating. You’ll discover that remnants from Ibiza's past are spread all over this quiet village. Step back in time by visiting relics such as the 18th century church in the village square. For a taste of the local culture there is an artisan market every Sunday where locals and tourists mingle to sample the selection of fresh organic produce and handcrafted goods. Considering the size of the island, nothing is remote. With dependable public transport and a quality road infrastructure, nothing is out of reach. The island's mild climate turns this destination into a perfect holiday location all-year round. A number of splendid rental properties in Sant Joan can be booked via Clickstay. We offer a variety of holiday villas and apartments for rent to accommodate anyone. A flight from any major UK city to Ibiza is 2.5 hours long. Temperature reach approx. 30°C in the height of summer, while the winter months reach an average 9°C. During summer, sea temperatures average between 21 and 26°C. While November may drop down to 19, never going below 15°C. There are three Blue Flag beaches in San Juan: Port de San Miguel beach, S’Arenal Gross beach and Cala San Vicente. Torre de Portinatx is one of the 18th Century towers presiding the Ibizan coastline. It is located on the northern tip of the island, west of Porinatx. San Juan is the furthest region northwards and Ibiza's last village. While the buzz is happening on the eastern, western and, somewhat, southern part of the island, San Juan tends to stay quiet. It attracts mainly couples with children and holidaymakers looking for privacy. Even though the airport and San Juan are on opposite sides of Ibiza, it's a short car ride from the airport to the village. It takes some 30 minutes to reach San Juan via the E-10 road. The E-10 road from Eivissa to San Juan is also called Restaurant Road, or Restaurant Mile. A charming stretch of restaurants along the 5-mile section of the road from Eivissa offers a wide choice of cuisine. Most of these dining spots are open throughout the year and serve dishes from local to Italian delicacies. Some even serve MediterrAsian foods, which is becoming increasingly popular. San Juan is set amid the rolling countryside blending into the coastline. Rustic trails wind through the pinewood landscape that cover most of the region, where you'll find seven trekking routes. The routes are divided according to difficulty, with the easiest route just under 10km, and the more advanced stretching roughly 20km long. Every route provides a scenic journey with panoramic views of the coastline. If you get tired of walking, try horse riding at North Ride Ibiza. Apart from the usual water sports, there are a couple of activities that San Juan offers, especially. Diving is very popular in the waters around northwestern Ibiza. There are four distinctive locations when it comes to diving: Murada island, Xarraca, Xernas and Sa Aigua Blanca. Another alternative water sport is kayaking. The coastline from Na Xamena to Cala Portinatx is divided into four kayaking routes, based on length and difficulty. The water here is brilliantly blue and clear, thanks to the Posidonia Oceanica plant in the waters around Ibiza. Caves and caverns can be found around the more rocky coastline around Ibiza; the one that stands out is in San Juan. The Can Mark cave, or Cova de Can Marçà in Catalan, has been developed into an amusement park and is ideal for couples with small children. The region has no shortage of festivals either. Firecrackers and bonfires light up the region, while fiesta de San Juan reveals interesting cultural customs for any visitor to take part in. Celebrated in June, it welcomes the coming of summer, with plenty of attraction for kids. Why rent a property in San Juan with Clickstay? We're a trusted brand with secure online payment so you can book your villa or apartment in San Juan with confidence. We're trusted: with over ten years of trading and thousands of securely processed holiday rental bookings. We're also here to help – whether you're looking for that perfect San Juan rental or you're already on holiday, you can call or email our customer services team. Own a holiday villa or apartment in San Juan? Are you an owner or agent with high quality holiday villas or apartments in San Juan? Want to increase your rentals? Then sign up to Clickstay and manage your properties directly. We let you, the owner, contact renters directly. You can manage your property description, prices and availability through our online system. Our flexible system caters for all sorts of holiday rentals – from villas with private pools to beach front apartments. Our costs are low: we charge a £1, €1 or $1 sign-up fee and you can then advertise an unlimited number of properties directly to renters looking for a San Juan villa holiday. We charge 10% marketing commission when a renter books your property through the Clickstay site. With Santa Eulalia following closely behind, San Juan stands as the quietest, family-friendly region on the island. MediterrAsian diet is the latest palatable blend of Mediterranean and Asian cuisine served by many restaurants in the region and around the world. The small picturesque S'Illot d'es Rencli beach is located some 2km north of San Juan borough. Visit in high season for a livelier crowd. North Ride Ibiza is a horse riding service for all skill levels, located near Portinatx. The Church of Sant Miquel overlooks the village from a hillock to the north. It was built in the 16th and was expanded to include two side chapels in the 17th Century.